Now that summer is starting to wind down, I'm working my way back into sewing, and taking part in Lori's Farm Girl Vintage blog hop is the perfect primer. I made the Scrappy Maple Leaf block using a kona solid and some brown scraps from my stash. As we all know, paper piecing is my first love, and though, Lori's rotary cutting instructions in all three of her books are helping to make me a fan of rotary cutting. Lori's instructions are in written and diagram form which I am a huge fan of. I won't *even* pretend however, that I didn't have to square this block up a bit after I sewed it all together! 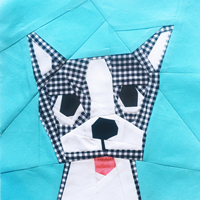 Farm Girl Vintage is chock full of fabulous blocks that depending on your fabric choices you could make into shabby chick, modern, cutesy, or more traditional looking blocks. Her book is fun and inspiring. You can get your copy at The Fat Quarter Shop here. 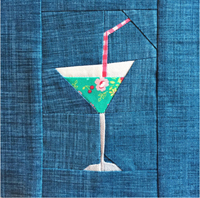 To check out all the blocks in Lori's book as well as the other sew along participants, click here! Seeing all the blocks together is inspiring and really worth a look! There are a lot of cute blocks in that pattern. Good job on your Mapleleaf! and those browns choices of yours are so perfect. Thanks so much for blogging about it! I'm always a fan of your beautiful work.